The driver of a pickup truck involved in a crash Friday in Polson was taken by helicopter to a Missoula hospital. 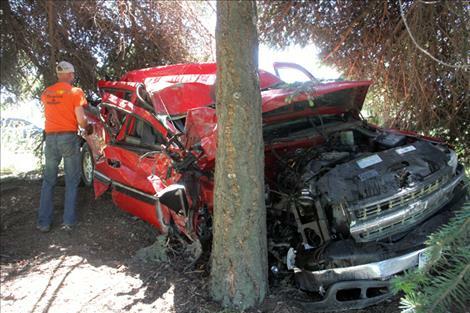 POLSON — A one-vehicle pickup wreck across from Richwine’s Burgerville on U.S. Highway 93 at about 2 p.m. Friday, June 5 sent the driver to Providence St. Joseph’s Hospital. The driver was then life-flighted to St. Patrick’s Hospital in Missoula, according to Montana Highway Patrol Sergeant Rich Salois. Salois said the driver was not wearing a seat belt and was alone in the vehicle. 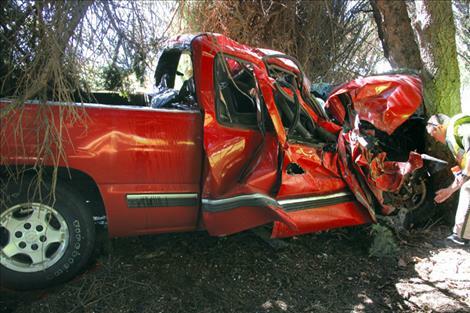 The crash caused substantial damage to the red Chevy pickup. According to law enforcement offcials, it appears the driver just drifted off the road and hit a tree. Salois said the cause of the wreck is still under investigation.